Angelo Mathews’ hamstring injury will keep him out of the forthcoming Test series against Bangladesh at home, as doctors who assessed him on Tuesday had advised further rest to heal the injury. The Sri Lankan skipper was expected to be fit to lead the side against Bangladesh, having missed out the South African ODI’s and the three-match T20 series against Australia, but the healing process seems to take more time than it was initially expected. 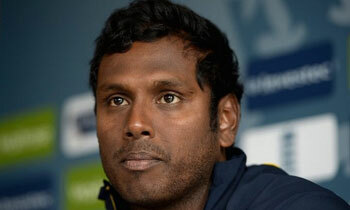 Mathews sustained injury during his match winning knock in the second T20 against South Africa last month and immediately returned home to start the rehabilitation process. “Yes, I will be out of the Test series,” Mathews said. “The rehabilitation process is taking longer than expected. “The injury is bit more serious than what we thought. There’s a tendon tear as well which is delaying the recovery,” he explained. Mathews was initially advised four to five weeks of rest to recover completely but given his current situation, he is likely to miss the three –match ODI series which will follow the two-Tests against Bangladesh. Mathews also missed the Zimbabwe series, after he tore his calf during the fourth ODI against Australia in September last year, despite being named in the original squad for the tour. In his absence, Rangana Herath, the 38-year-old veteran spinner is likely to lead the side as he did during the two-match series in Zimbabwe.